California is in the third year of a drought. I report on this only because I live in California. I like where I live right now because as you know, I build kayaks and kayaks need water and the place where I live, Alameda an island in San Francisco Bay gives me ready access to the water. But the water is salty and not suitable for drinking. In Alameda, water for drinking comes from reservoirs which store winter rain runoff. When winter rains are insufficient, water from the San Joaquin and Sacramento rivers is pumped into the reservoirs. The picture above shows what California looks like right now to a climatologist. The darker the color, the worse the drought. As you can see, a good part of the state is in the chocolate condition. Let us zoom out a bit for perspective. 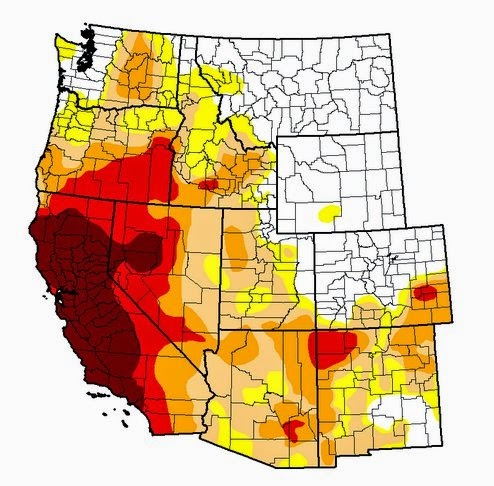 Washington, Oregon, Idaho, Nevada, Utah, Arizona and New Mexico also have a bit of drought but nobody has as much chocolate colored drought as California. The chart above puts names with the colors. 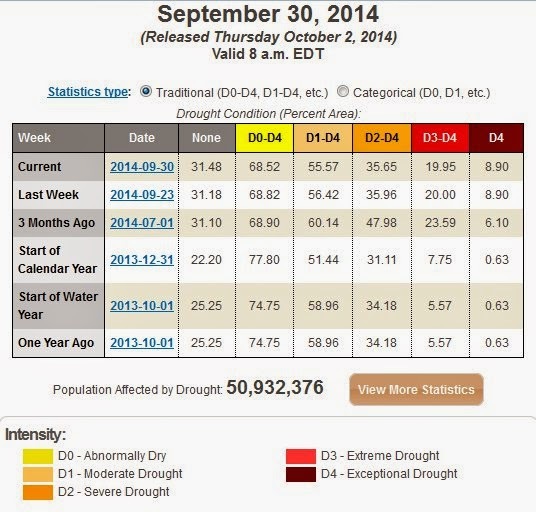 Drought goes from Abnormally Dry to Moderate, then Severe, then Extreme and then Exceptional. As the names indicate, California is having a drought that would not have been considered normal when the names for the severity of drought were made up. 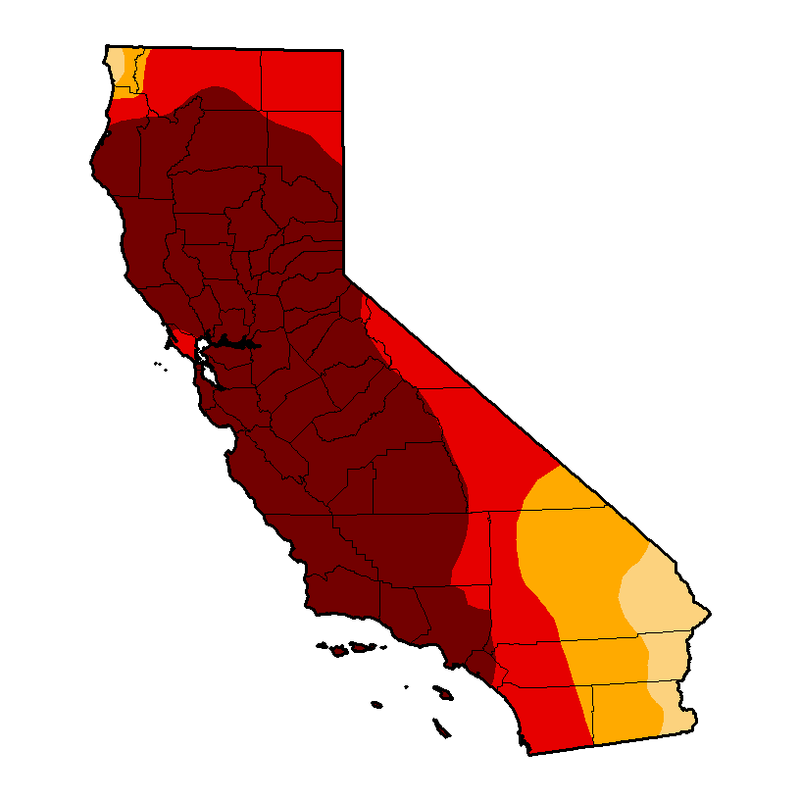 We are told, furthermore, that in the past, Californian droughts have lasted from years to decades, maybe even centuries and nobody seems to know what sort of duration this particular drought will have. Long term droughts are game changers. 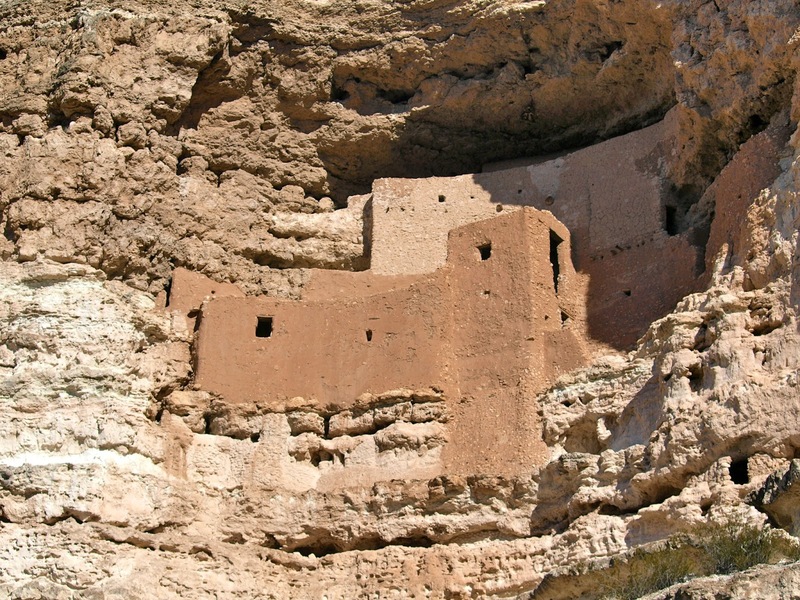 The photo above is of a place in Camp Verde, Arizona called Montezuma's Castle. The people who built these dwellings apparently abandoned the area during a prolonged drought. The people who lived there were primarily farmers, raising the usual southwestern crops, irrigated by the river that flowed at the base of their cliff dwelling. The moral of the Camp Verde story seems to be that no matter how swell the place you're living in may be, if you don't have water, you go elsewhere. So, even though this is strictly in the realm of speculation, prolonged drought in California could well depopulate the state significantly. Californian climate refugees would move elsewhere. Farm workers would move back to the Spanish speaking parts of North America. North American cuisine would revert to what it was in the 50's, that is, lots of canned green beans in the winter and canned spinach and canned corn. Vegetarianism would go back out of style. The prime users of water in California are of course the farms and orchards that raise the 20 billion dollars worth of crops that are grown in California's Central Valley. If the Central Valley turned back to grasslands and oak savannah, perhaps some coastal cities could still survive on the water that was left over. Who knows. In the meantime, water use is being curtailed. Lawns are going unwatered, trees are dying and so on.